Sopapillas (pronounced like “soap-uh-pee-yuh”) are normally a fried pastry, made with the same dough that is used for tortillas or frybread. It’s rolled thin, cut into rectangles, and deep fried where it puffs up to a hollow ready-to-fill piece of bread. Normally, it’s eaten with chili or some savory sauce, or honey for a sweet treat. I’ve never heard of sopapillas in connection with cheesecake, and if anyone mentioned such a thing, I’d anticipate a ready made cheesecake filling being spooned or piped into fresh sopapillas. That’s not what this is. It’s nothing like a sopapilla in one sense, but if a sopapilla COULD include cheesecake filling, this is what it would taste like. Best of all, it can be cut into bars for serving. It’s also amazing and delicious, plus being plain easy to make. For this, the only equipment needed is an oven, a mixing bowl, a 9×13″ baking pan, and an electric mixer. In a separate bowl blend the cream cheese, 1 1/2 cup sugar, 1 tsp. vanilla and 1 egg with mixer until smooth. Spread cheese mixture over top of dough. Unroll the second can of crescent rolls and place on top of the cream cheese mixture, pressing seams together again. 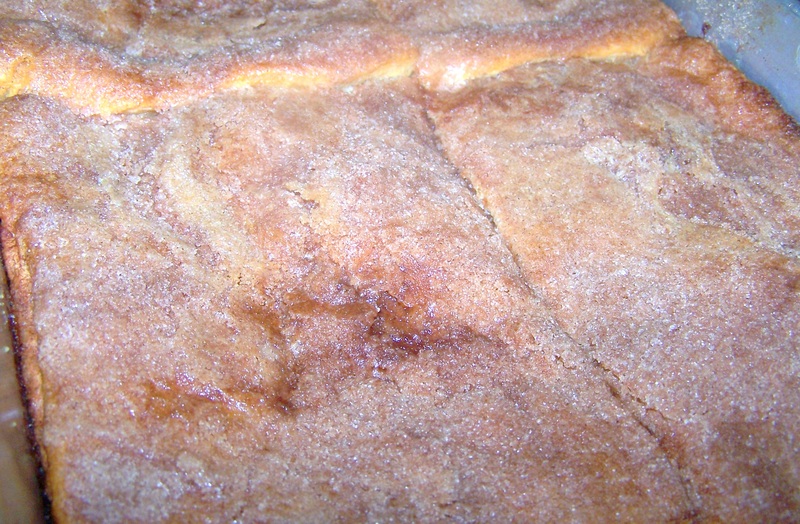 Mix remaining 1/2 cup of sugar and cinnamon together and then sprinkle over top of dough. Melt butter and pour over cinnamon & sugar sprinkled dough. Bake in hot oven for 30-40 minutes or until golden brown. Remove from oven and cool before serving. Refrigerate leftovers in tightly sealed container. This entry was posted in Cookies & Bars, Desserts, Easy, Make-Ahead and tagged budget, dessert, easy, family, ideas, quick. Bookmark the permalink.